Director/Story – Albert Pyun, Screenplay – Albert Pyun & Ed Naha, Producers – Tom Karnowski & Gary Schmoeller, Photography – George Mooradian, Music – Tony Riparetti, Visual Effects – Stargate Films, Makeup Effects – Dan Rebert, Makeup Design – Maurine Schlenz, Production Design – Nenad Pecur. Production Company – Largo Entertainment/Toga Productions/Filmwerks. On the last day of the great war, a stray bullet hits the military android Omega Doom, shorting out its programming and Prime Directive, causing it to discover free will. Omega Doom wanders through the post-holocaust chaos. It is rumoured that the humans will emerge from their shelters soon so all the androids are searching for guns. Omega Doom wanders into an area of the city where two camps of androids, the Roms and the Droids, are at a standoff, both believing a cache of weapons is hidden nearby. Omega Doom is fought over by the two factions of warring androids when it is discovered he has knowledge that can lead them to the cache of weapons. Omega Doom is one of Albert Pyun’s android/cyborg post-holocaust films. Pyun has been prolific in producing a host of similar films, including Cyborg (1989), Nemesis (1993) and its three sequels, Knights (1993) and Heatseeker (1995). These usually feature messianic androids traversing post-holocaust wastelands and/or engaged in martial arts/kickboxing duels. Albert Pyun’s films tend to fall between the occasionally interesting – Nemesis – and the merely mindless – Knights and Cyborg. Omega Doom falls on the occasionally interesting side. The plot has been stolen from Akira Kurosawa’s Yojimbo (1961), which concerns a swordsman who arrives in a small town and plays two criminal gangs off against each other. Pyun has intriguingly updated the story to the B science-fiction movie post-holocaust action playground with warring factions of androids replacing the factions of the original. The Yojimbo plot has influenced a number of other filmmakers, most notedly the Spaghetti Western A Fistful of Dollars (1964). It also updated and played out amongst mobsters in the Prohibition Era in by Walter Hill Last Man Standing (1996) the same year as this came out. On the minus side, there is the usual share of Pyun-esque silliness – Pyun’s androids are rarely ever more than standard action characters with occasional bits of circuitry showing – Omega Doom features daft ideas like a bartender running a bar for androids. 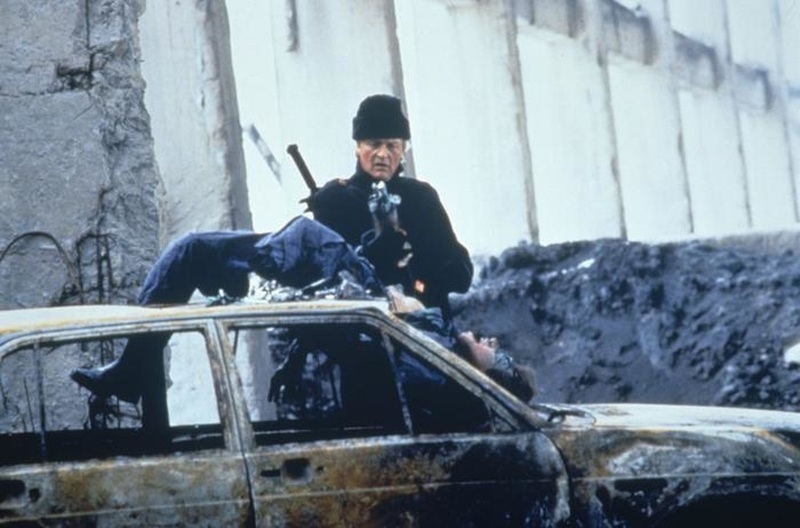 Much is made of Rutger Hauer’s titular android being the first to adopt human characteristics due to a stray shot wiping his programming but the script either never explains the reason for the human-like behaviour of the other androids in the film or distinguishes Hauer’s actions from them sufficiently to make any sense of this point. The budget appears cramped – all of the action is confined to a single ruined city block and neither warring faction appears to have any more than three warriors apiece. Omega Doom is also low key for an Albert Pyun film when it comes to the action and is lacking in his usual extended kickboxing scenes. However, if one can put aside the relative silliness, Pyun occasionally achieves an effective atmosphere of hard-bitten cynicism that raises Omega Doom slightly above the average run of the mill B science-fiction/action film. Albert Pyun’s other films are:– The Sword and the Sorceror (1982), Radioactive Dreams (1986), Vicious Lips/Pleasure Planet (1987), Alien from L.A. (1988), the uncredited Journey to the Center of the Earth (1988), Cyborg (1989), Deceit (1989), Captain America (1990), Dollman (1990), Brain Smasher: A Love Story (1993), Knights (1993), Nemesis (1993), Arcade (1994), Heatseeker (1995), Hong Kong 1997 (1994), Nemesis 2: Nebula (1995), Nemesis 3: Timelapse (1995), Adrenalin: Fear the Rush (1996), Nemesis 4: Death Angel (1996), Postmortem (1997), Ticker (2001), Infection (2005), Cool Air (2006), Bulletface (2007), Left for Dead (2007), Tales of an Ancient Empire (2010), The Interrogation of Cheryl Cooper (2014) and Interstellar Civil War (2017).